People in urban and suburban areas often use the term “invasive” to describe plants or weeds that appear to take over a garden or landscape. However, true invasive plants are weeds that infest ecosystems, rangelands, and pasture—places common garden weeds don't thrive. Invasive plants—plants that can disperse, establish, and spread without human assistance or disturbance—pose a serious problem in California's waterways, wildlands and rangelands. Common garden weeds, unlike invasive plants, don't generally thrive outside of cultivation. 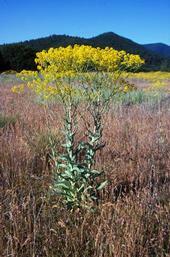 About 1,500 non-native plant species are currently established in California, mostly in wildlands. Almost two thirds were intentionally introduced as ornamentals from the nursery industry, or for the purposes of soil stabilization, animal forage, human food, fiber or medicinal plants.